Typhoon is an all-in-one bundle of digital DJ hardware and software, offering total control to mix, scratch, and play music as a DJ would right at your fingertips. The included software transforms your computer into a full-blown DJ system. 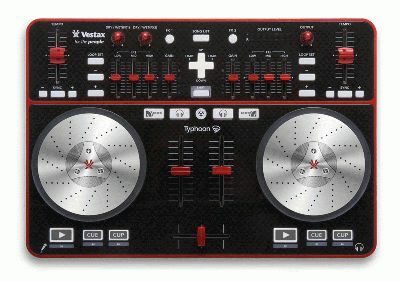 Whether for the beginner or seasoned pros alike, plug Typhoon into your computer and you become a DJ. Multi Channel Audio System : Typhoon comes with high quality sound for monitoring, master output and a separate microphone input. Compact and Light : Completely travel friendly, the unit is perfect for users on-the-go. A simple USB cable and bundled software will have the user spinning wherever they please. Virtual DJ is an audio/video mixing software developed by Atomix Productions Inc. It is used by Mobile/Club DJs and by millions of users in the world. The version bundled with Typhoon has been tailor made for intuitive mixing.